The other day, I got to wondering which might be the oldest structure still standing in Covina. Considering how few buildings from the turn of the last century must remain, the field of candidates could not be very large. Citrus Avenue would probably be a good first place to look. I can't think of anywhere else in town where more structures from that time period could still be standing – at least commercial ones. The logical place to find this information is the Los Angeles County Office of the Assessor. The Assessor maintains public records for every parcel of land: its legal description, its valuation, etc. If the parcel has a building on it, the original year of construction is also recorded. Fortunately, the County Assessor has an interactive map online where the public can easily access all of this information. Although not the oldest, the building that has remained in its original state of construction for the longest period of time is 126 N. Citrus – originally the Warner & Whitsel Grocery, and the place most of us who grew up in Covina knew as Custer's. The Assessor's record states that it was built in 1905. I have to question that date, however, as a photo taken on the Fourth of July, 1906, clearly shows the older Warner store still standing. Additionally, two historical accounts agree that the new grocery building did not open until Summer, 1909. Whatever its actual construction date, however, aside from some modification to its frontage and interior over the decades, the Warner/Custer's building has remained largely unchanged and still recognizable for the last 105+ years. 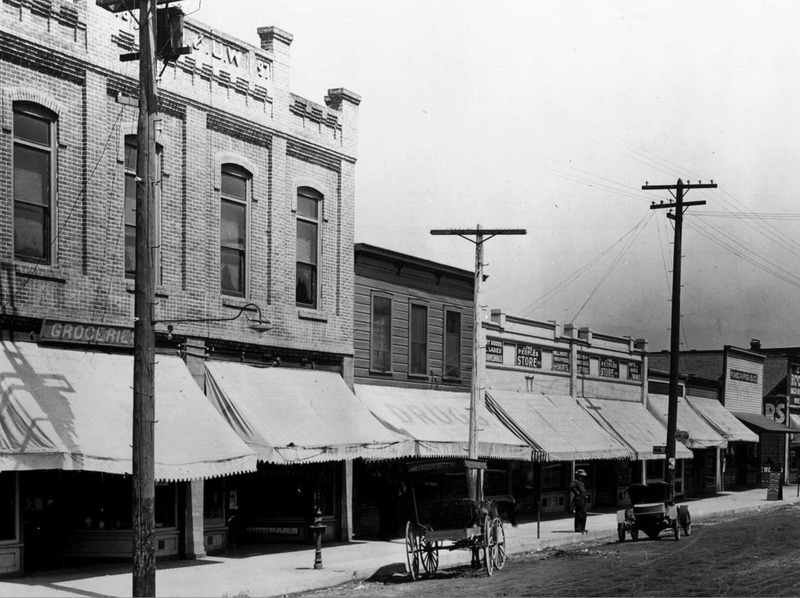 The Warner & Whitsel Grocery (later Custer's, left) and the Allison-Webb Building, circa 1910. 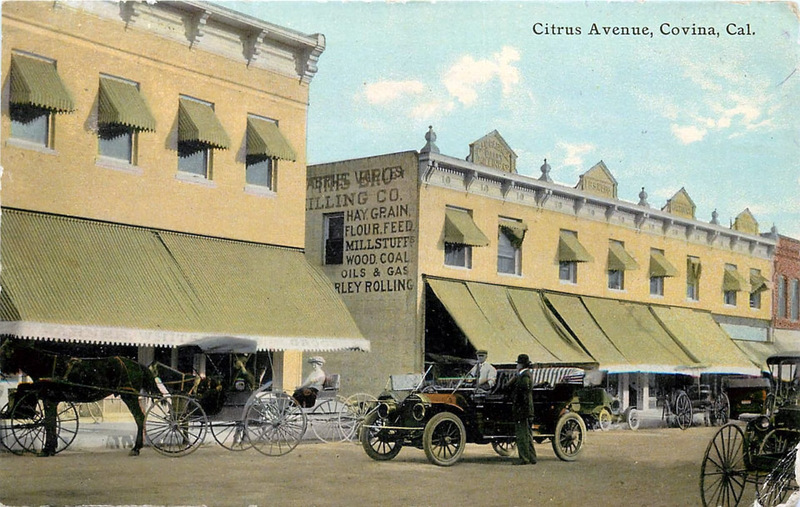 The earliest build date on the east side of Citrus is given as 1880, for the parcel at the northeast corner of Citrus and Badillo. This cannot be correct. According to Donald Pflueger's 1964 history, there were no buildings at all in "downtown" Covina until December, 1884, when the office and print shop of the Covina Independent newspaper was erected at the southwest corner of Citrus and Badillo. The only buildings in the Covina area before 1884 were the Badilla/Phillips house at the southwest corner of the San Bernardino stage road and what would later be known as Hollenbeck Avenue, and a handful of simple structures at "Citrus:" a pioneer settlement established in the 1870s which was located at today's intersection of Citrus Avenue and Cypress Street. Returning to the northeast corner of Citrus and Badillo, the first building at that location was constructed in 1885: F. E. Grover's general mercantile store at 104 N. Citrus. 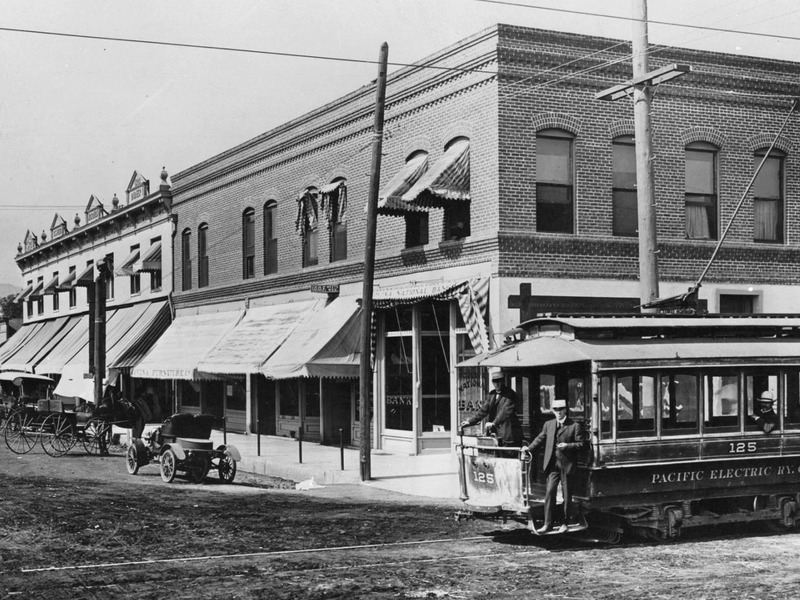 In 1900, the landmark Reed Block – best known for later housing the Covina Theater – was erected on that corner. It stood for over a hundred years until 2004, when it was razed to construct the Covina Center for the Performing Arts. Although the present building closely resembles the old Reed Block, it is an entirely different structure than the historic building so familiar to generations of Covinans. The oldest building still standing on the east side of Citrus is actually next door to the former theater – The Allison-Webb Building at 114 N. Citrus – which is now occupied by the unwholesomely-named "Rude Dog Bar & Grill." It was constructed in 1903, though looking at its current false front, 114 N. Citrus today is completely unrecognizable to anyone who grew up in 20th century Covina. The Reed Block (1900) and the Allison-Webb Building (1903, left) circa 1905. Courtesy USC Digital Library. Click image to enlarge. On the west side of Citrus, across the street from the former location of the Covina Theater, there is another candidate for Covina's oldest existing structure: the Chapman-Workman Building (now called the Old Covina Bank Building) at 101 N. Citrus. The Assessor's record shows (as does a photo of the building, below) that it was erected in 1897. 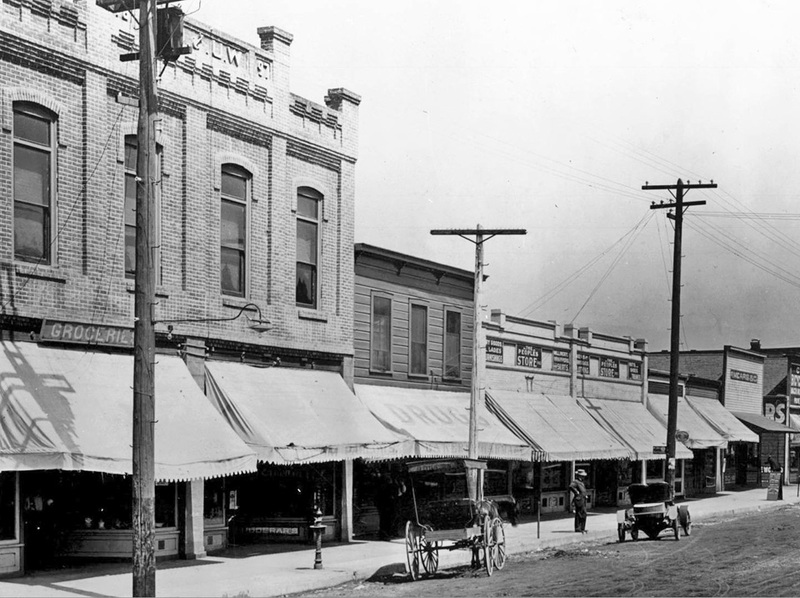 The Chapman-Workman Building (1897, left) and the actual oldest building in Covina (1885, center) circa 1905. But even the Chapman Building isn't the winning entry in our race. Turns out the oldest existing commercial structure in Covina is actually the little hole-in-the-wall storefront next door: 111 North Citrus (the dark two-storey building in the center of the photo above). The Assessor gives its build date as 1885, with its "Effective Year Built" being 1905 (probably when the second storey was added). Here it is today. Not much to look at, is it? 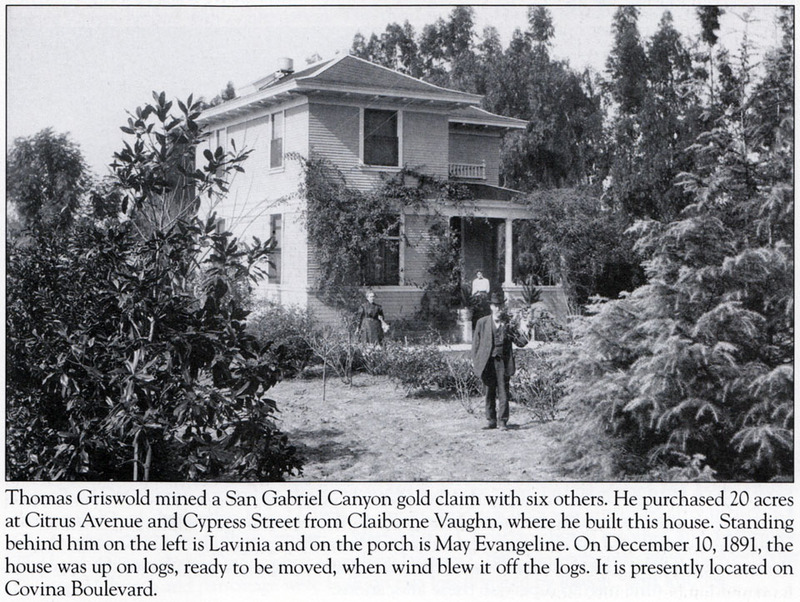 But, evidently, behind that chintzy 20th century facade, and inside its walls, is one of the very first structures built in J. S. Phillips's pioneer township of Covina. Concerning houses, it appears some of the oldest ones still standing in the original residential section of Covina are three small homes built in a row in 1901 on Cottage Street. It's actually quite shocking to me just how few private dwellings remain in the downtown area bounded by Badillo, 2nd, Hollenbeck and San Bernardino Road. Most of them were swallowed up over the years by municipal parking lots, and by Inter-Community Hospital. The oldest residence of all, however, would almost certainly be the Thomas Griswold House, originally built at the intersection of Citrus and Cypress in the aforementioned settlement of Citrus circa 1886. Source: Images of America: Covina, by Barbara Ann Hall, Ph.D., Covina Valley Historical Society, Arcadia Publishing, 2007.